July 2 – Denali – It is a cloudy day. We moved the Hilton4 to Denali National Park, in the Savage Creek Campground. We had 1:00 PM tickets to tour the park. We missed the bus because the campground where we were to park was 15 miles into the park with several stops from road crews coming and going. We were able to change the tickets to 2:00PM. The tour was 8 hours long. Yes 8 hours. Yikes!!!! It was well worth it. It was only 1 of 4 tours that would help you to see the elusive Mt. McKinley. We learned many things about the area from our driver/tour guide who just happens to be from Kentucky. Everything in the park is owned by the National Parks Service. (i.e. US government, really you and me) The park was established in 1917. 2 million acres of land was awarded by the then current president. Another president awarded an additional 4 million acres. There is no motor transportation in the winter. Everything is done by dog sledding. Rangers travel over 3,000 miles in the winter. The snowy winter temperature is usually -70° with 100 MPH wind. There is only a 2 month growing season. We were looking real hard for a moose but no luck. Mooses eat 60-80 lbs of leaves a day. They lay down for 6 hrs to sleep and burn 1,000 calories. Dang, what is the fairness of that? I look at a plate of spaghetti and gain 5 lbs. Moose weight 1,400 lbs and are 7 feet tall at the shoulders. Their antlers grow 1 lb a day for a total weight of 45 lbs. Did you know female moose don’t shed their antlers while pregnant? Got to protect those little moose from prey. Finally, the sun has come out. We were able to see our first Caribou. Some antlers were bright red. This happens because blood vessels are in the antlers. As they start getting harder the red is not as pronounced. Caribou and reindeer are the same. Reindeers are just domesticated. I guess that is why Santa didn’t get a Caribou to pull the sleigh. He couldn’t rein them in. Ok bad joke. We also learned about tundra, timberline etc. Because of the snow it takes 4 trees intertwined to make 1 tree. They all lean on each other for strength. Boy we could take some lessons from these trees. Did you know the Dall sheep is the only all white sheep in the world? They love being on cliffs. They don’t have to drink water because they get water from the trees and bushes. You know those squirrels the insurance company uses for TV? The ones who are doing the squirrel dance and handshake after they made a car wreck trying to avoid them? Well they are for real in this park. As we were traveling Alvin, Simon & Theodore would jump on the road and do their little dance. They know the buses will do everything they can not to hit them. Even if they have to through passengers out of their seats. Imagine those little buggers standing on the road. They are only 7” tall. They stared us down like Rambo and would not move until they wanted to. They better be glad my folk weren’t around. They would be in a stew and the tail used as a key ring. They are called Arctic Ground Squirrels. They survive in the park because they hibernate. Their heart beat is 200 beats per minute in the summer. 1-2 beats in the winter. You could pick them up and roll them and they will not wake up. There were some scary roads getting to the base of Mt McKinley. One point is called Polychrome Overlook. The people building the road called it Poison Point. One drop and you are dead. It drop 1,000 ft down. There are no guard rails and one lane. So far no one has ever gone off the road. I guess this is why only seasoned bus drivers are allowed to travel these roads. We saw a blond bear and its cub and a brown bear. Did you know that male bears will eat the cubs? That is why moms are much protected of their young. Sounds like a good mom to me. However, I know some real protected human dads. At 7:30 PM we finally got to the Eielson Visitor Center at one of the bases of Mt. McKinley. We could only see 1/3 of the mountain. The area was amazing, just thinking about the creations of God and what he really has in store for us. The first climber arrived in 1915. Today, climbers are helicoptered in at 7,000 feet. 3 feet of slow can fall over night. 40 climbers are rescued every year. High altitude edema is deadly. Any climber getting this must go down immediately or die. Only 1,500 climbers are allowed on the mountain a year. Whatever you pack in you pack out. This includes your human waste. On our way back it started to rain heavily. Of course it did before we got to Poison Point. Ken Harlan our driver/guide use to drive for Princess Tours so he knew what to do. Can you believe it stopped raining after we passed the point! We arrived safely at 10:00PM at the center. Of course it’s still bright out. We travel the 15 miles back on the road we just came off to our campground. Happy has clams for a good day. Question of the day – What is the height of Mt. McKinley? Well look it up and let me know your answer. Bonus Question of the day – Which President signed the approval to make Denali a park? Well look it up and let me know your answer. Super Bonus Question of the day – Which President signed the approval to make Denali a 6 million acre park? Well look it up and let me know your answer. July 3 – Denali - Today we moved the Hilton4 down to the Riley Campground. It is closer to the beginning of the park. 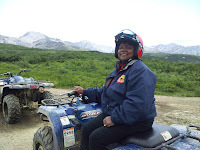 Since we have been in AK we have seen all kinds of ATVS. Seems like everybody and their mama have one. While we were touring the town on Sunday I kept being drawn to the ATV’s Adventure store. I mentioned to Lo and he said just go see what it entails. I did and I thought naw not for me. I asked Lo what is on the menu for today and he said I thought you were going to ride the ATV’s. I said we could go look at it again. Next thing I know I have a 1:00 PM appointment. Lo did not go. He has ridden before and wasn’t interested. It was a blast. It was like jet skiing on dirt. Now ya’ll know how I love to Jet Ski. There were 8 ATV’s going through water, mud, rivers and an old mining area. We actually saw a moose and it calf in the woods 10’ away while ridding. I came back dirty and muddy but happy. Yahooo! We decided to go see the ranger dog sled show. There has been a working dogsled team in the park since 1939. Since the only way to get around the park in the winter is dog sledding, the animals are well trained and cared for. Dogs can mean life or death to a ranger. They really get to know their dog teams. July 4 – Fairbanks- Today is a travel day. Overcast day. As we drive the 125 miles to Fairbanks we wonder at the beautiful areas. The trees are not tall but that is ok because you see the rivers and creeks snaking through the land. We pass the road to Univ of AK (UAF). We went to our usual hotel and found that they have parking areas for RV’s already mapped out. We unhooked the car and decided to tour the town. We ate at Geraldo’s Italian and then found an ice cream placed called “Hot Licks Homemade Ice Cream”. Now, ya’ll know I am not an ice cream person so this was Lo’s treat. He had something with raisin and was quite happy. It did not look like Fenton’s had anything to worry about in competition. We drove to the Pioneer Park since lots of cars were there. We stopped a lady and asked when the fireworks were going to start. She looked a little perplexed. I explained that we had seen lots of fireworks stands along the freeway. She said, “Oh that is just something for the young people. We have our fireworks on New Year’s Eve, when you can see them. What is a fireworks while the sun is still out?” Well she had a point. I guess I am so use to Cally that I plum forgot about the sun. July 5 – Fairbanks- Beautiful sunny day. This is the first time I can actually put on shorts and no coat. We found the Morris Thompson Cultural and Visitor’s Center. What a center. It is dedicated to Mr. Thompson for all he did to bring the cultures together since he was from both sides. It walked you through the beginning of AK. How the native tribes, trappers and fishermen lived and everything we think of as AK. This is a must see if you come to Fairbanks. We saw a video on one man’s journey of coming to AK at 51 yr old for 2 years. Building a house of log and living off the land. He actually wound up staying for 30 years. He only left because the winters were too cold for his old bones. We willed his home as a pioneer to the state. Some things we learned at the center were: Chickadee birds are Brainae Birds. They remember where they have hidden tens of thousands of cache seeds. Each fall their hippocampus (the part of the brain responsible for spatial memory) grows new nerve cells and increases 30% in size. As winter progress and is less to remember the brain slowly returns to the normal size. God is amazing how he created each person, animals, etc. If a little bird can remember where he put the seeds, why can’t we remember where we put the car keys?? God definitely has a sense of humor. Remember Rambo Arctic Ground Squirrels from the Denali day? Well, we found more info. While burrowing in the winter their bodies temperature can fall as low as 27° without freezing. We took a tour of Univ of AK (UAF). These means a lot to me as I worked on this account for 20 years. It is good to finally see it and all it has to offer. It sits in the hills among the trees. It has everything a town has. It has some of the best views of Fairbanks. It has a beautiful museum and has the largest public display of gold. Hmmmm! I wonder if they are willing to spread some of that around. We left the hills and went to Pioneer Park. This is an interesting place. It had a historical paddleboat, historical cabins, railroad depot and train, gold rush town, miniature golf, canoe and boat launches. There was one shop where the owner did carving. He was chilling out front as we chatted. I really wasn’t interested in the items he had for sale but decided to just take a look. It was so funny, as I started to go in he sends in his Great Dane “Charley” to help me find something or protect the shop. I couldn’t figure out which since he went in and went to sleep. Really!!! The whole shop was as big as my dining room. We had enough and called it an early day. Question of the day – Where did the name Fairbanks come from? Well look it up and let me know your answer. time Iditarod champion. Her husband Dave still runs the dog kennel. He gave us a demo on how the dogs are trained and how fast they really can run. Lead dogs are developed and trained. They set the pace. Just like humans, there are leaders, followers and wheel dogs. These are the ones nearest the load. Endurance is the key to each dog for racing. AK Huskies are fast runners. Siberian Huskies are for pulling. They do not run in Iditarod. Susan’s story is an interesting one. She was born in Massachusetts. She came to AK as a young woman. Got interested in dog sledding and decided to enter the Iditarod. They told the “little lady” this was a man’s sport and she could never endure or win. Now men should know by now if you challenge a woman with those words lookout. Not only did she win she put the race in the fore front of the world. Unfortunately she died in 2006 with Leukemia. She was 51 years old. But her legacy lives on. We proceed to an Athabascan Indian village. We were put in groups and did a round robin to hear all of the culture of village life. We saw how fish were trapped and filleted, tanning hides, reindeer used and how clothes were made. It you know the big furry coats are made from many different hides? You could tell which tribe a person was from by the patterns used in the clothes. A native wife wanted to be sure her man looked good when going out to hunt so beading was important. We left the village and returned up stream. Here are facts we learned: The Athabascan tribes are related to the Apache and Navajo tribes. The extended logs on a log house is for hanging meat to dry high so no animals can reach it. When it dries it goes in the cache. (Freezer now days) The average age in AK is 27 yrs old. This is due to the university and the military. When we returned to the dock we went to the trading store. They had a room that was -40°. We went inside. It was so cold we could only stay seconds. Your pants felt like they were ready to crackle. We went to dinner and called it a day and got ready for Sabbath. Question of the day – What is the name of the show that took an infamous 3 hour tour? Well look it up and let me know your answer. Bonus Question of the day – What is the name of the dog Susan Butcher used in her Iditarod wins? Well look it up and let me know your answer. July 7 – Fairbanks – Today is Sabbath. We awoke to another sunny day. We went to the Fairbanks Church. Our friends Eric & Holly Proell and their kids Ben & Jillian go to this church. Holly invited us to go Olens Pond for the afternoon. She had a friend who use to go to her church come up for the holiday weekend. The Pond really was a mini lake. You could camp around it for free. We all took a walk. Some of us made it to the Alaska Pipeline area. This was a jaunty 2.5 mile walk one way. Others made it 1 mile. You do not have to ask who!! It rained for a few minutes. Boy that was good. The mosquitoes were out in full force but the rain slowed them down. We roasted wieners, big franks, moose and Reindeer franks and smores. We sat around the campfire and caught up on each other’s lives. It was getting late (9:30) so we had prayer and bide our friends good bye. Since someone did not get to see the Pipeline we stopped on our way home to check it out. Question of the day – Where does the AK Pipeline start and end? Well look it up and let me know your answer. Bonus Question of the day – What is the date the first oil moved through the pipeline? Well look it up and let me know your answer. July 8 – Chena Hot Springs – Another sunny day. Many people have told us about Chena Hot Springs and the Aurora Ice Museum. So we decided to take the 60 mile drive. As usual the drive is very peaceful. We saw a moose in the water on our way up. Upon reaching the springs it looked more like a dude ranch. We just got there in time to take the next tour of the Ice Museum. We had to don parkas provided by the museum to go in. It was unbelievable what the ice carvers could do. There was jousting horses, ice princess, globes of a baseball, fire, golf ball, houses, and polar bears holding a Coke, jaguar, igloo house, chandeliers, Sarah Palin and her bulldog. There was a full ice bar that they serve an appletini. You got to take the carved martini ice glass with you. That was a joke unless you had a cooler with dry ice. It would melt in no time. There was also a “Ice Hotel”. You could stay there for $500 a night. They also reserve you a room in the Moose Lodge at the same time because no one has survived a full night. The museum as is a wedding and event venture. We ventured on to the pool and springs. The springs was only for the adults. Hallelujah! No splashing and hollering. It was hot and very soothing to these old bones. We met tourist and locals who we were able to swap stories with. We found out new places to see and tour. Lo found a tourist who was a air traffic controller. This was right down his alley. They were able to talk in “FAA lingo”. We also met a church member of the church we went to yesterday and her mom. Ruth was very interesting. She is a CPA teaching at UAF. We met people from lL, NY, MI. After being in the springs for 4 hours we decided to head to the Silver Gulch restaurant recommended by Ruth. Boy this was a mistake. Ruth had told us that the french frys and onion rings were awesome. We were seating by a great waitress. We looked over the menu and noticed that they had a grill and asked for a grill cheese. Waitress said she would ask the chef. She came back later and said it was not available. We said ok how about a cheese sandwich. She said she would ask the chef. She came back and said it was not available. By this time we just asked for our frys and onion rings to go. Lo asked her if they had a grill and she said yes! The waitress was really ticked with the chef and went to speak with the manager. The manager spoke with the chef. He said he wasn’t going to do our request because he did not want to start “substitute anything from the menu”. The manager was ticked. He spoke to us about this and apologized profusely. He was from the Anchorage restaurant and just helping out but he would be letting the manager of that facility know. Trust me we could not get out of there fast enough. The onion rings and frys were really good. We left the waitress a good tip. The chef should be glad the “Richmond ghetto girl” as by brother-in-law calls it, didn’t come out. It was still a great day. Question of the day – What is the temperature of the Aurora Ice Museum? Well look it up and let me know your answer. First I thought, "Oh, I know this one," about Denali, and figured it was Prez McKinley who made it a park - but then remembered he died in office, before he really even saw too much of AK, so correctly found it was Wilson who signed the area into a park. WHO KNEW that it was Jimmy Carter who made it a biiiig reserve area!? I certainly did not; the things you learn when you research! Meanwhile, ATV's and hot springs! You are living the life! I'm also fascinated by the very cool - all of 20° - ice sculpture place. I need to someday visit Fairbanks; this is why it's much cooler to RV it through AK than take the cruise ships, because I don't think they get to all the best places. So glad you got to see Eric and Holly - I was hoping you could catch up with them. So good to have so many good people in every corner of the world - you have friends everywhere. This looks and sounds like you're having a wonderful time. I'm so sorry that we missed you this time around, but am glad that you're getting to enjoy some travel time and see lots of interesting things. I look forward to having a good look through all of the pictures you're taking! I fianlly got my comments to work! I'm so glad that you are having such a fun time. We can't wait to see you. Kaylani misses you greatly!.